TX Series Pressure Gauges in... 2 1/16" or 2 5/8"
A Total Revolution in Gauge Design! 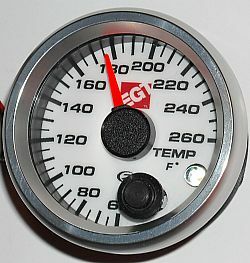 EGT also offers the complete package in gauge design. The ultimate in custom quality, easy to read electronic gauges. DC Voltage Only, but can use a bridge rectifier on AC models. Max Recall on Temps, Min & Max on Pressure/ Boost gauges. A super thin carbon composite case design allows easy mounting in tight locations. Bright anodized solid Aluminum bezel. White Face is Standard, Optional Black face is available. An internal microprocessor controls the needle movement through a digital stepper motor. The high torque of the stepper motor ensures accurate pointer movement without vibration in all conditions. CLICK HERE to view these Outstanding Instruments!